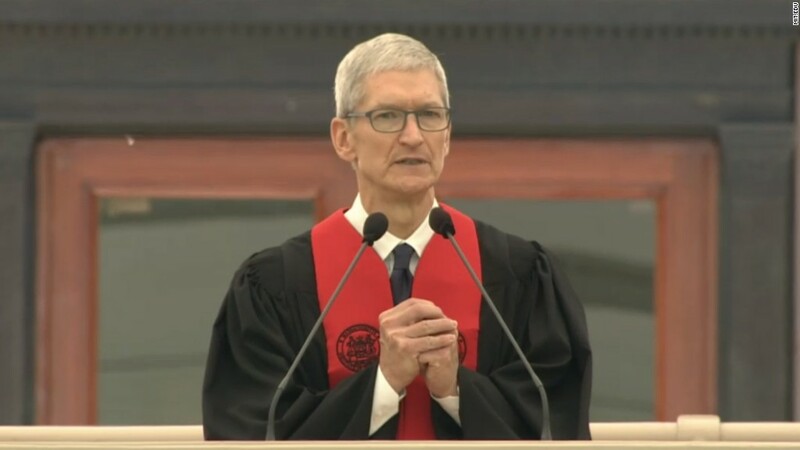 Tim Cook's stewardship of Apple is paying off. The iPhone maker's CEO received company stock worth $89 million last week after hitting a key performance target, according to a regulatory filing Monday. The payout is part of the huge welcome package that Apple (AAPL) gave Cook after he succeeded Steve Jobs in 2011. Cook only gets the shares in fixed amounts as they vest over a period of years. Half of the latest batch was linked to the performance of Apple's share price compared with those of other S&P 500 companies. Because Apple outperformed more than two-thirds of the companies in the index over the past three years, Cook received the full payout, the filing said. Not all the money ended up in Cook's hands, though. Apple said it set aside about $46 million to meet tax requirements. Cook sold off the other shares between Thursday and Monday for a total of about $43 million. The filing didn't say what Cook plans to do with the money, and an Apple spokesman declined to comment. But the Apple CEO said in 2015 that he plans to give most of his wealth away to charity. The huge stock grant the tech company gave Cook in 2011 was valued at around $380 million at the time. But Apple's share price gains since then mean the nearly 3 million shares that are yet to vest are worth about $484 million at current prices. Cook also currently holds Apple shares worth about $145 million, according to the filing. The company's stock is up nearly 40% so far this year.